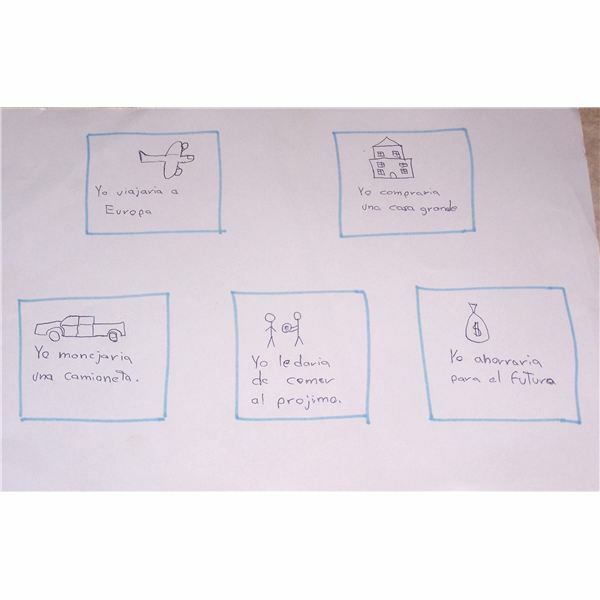 The conditional tense allows students to enter into the world of possibilities in Spanish. As students work with this tense, they become more aware of how to use the language theoretically, which will help them in the future as they move to subjunctive verbs. This lesson plan is a foundational plan that functions as an introduction to the conditional tense. Students will become familiar with conditional tense conjugations for regular verbs with –ar, -er, and –ir endings. Students will be able to use conditional tense verbs in a sentence successfully. Students will become familiar with the conditional tense of twelve irregular verbs. 1. Write the subject pronouns on the board (i.e. yo, tú, él, ella, usted, nosotros(as), ustedes, ellos(as)). *Note: vosotros(as) may be added in if necessary. 2. Describe how to use conditional tense: when describing possibilities and probabilities. Describe that in English, we use the words would and could to express this tense. 3. Remind the students of how in Spanish, verbs are conjugated to express tense. Also explain to students that conditional tense is similar to future in that –ar, -er, and –ir endings all are the same and that the verb stays the same and letters are added to the end. 4. Create a chart on the board and allow students to copy down in their notebooks. Give an example verb for each. 5. Put sentences on the board and have students come up and conjugate. 7. Write hypothetical situations on the board and have the students choose one to write about. Have the students come up with at least 5 things they would or could do in relation to the situation and illustrate. 8. If there is time, have students share their ideas with the class. Collect the papers in which the students responded to the hypothetical situations. This is an excellent exercise to put on the bulletin board or hang in the hallway because it demonstrates the students’ ability to use the conditional tense and allows them to express themselves in thoughtful ways. This lesson plan not only helps students work on their conditional tense usage, but also allows for some critical thinking, an extremely important learning tool in every area of life. Through creativity and critical thinking, students will become comfortable and confident as they learn their second language!